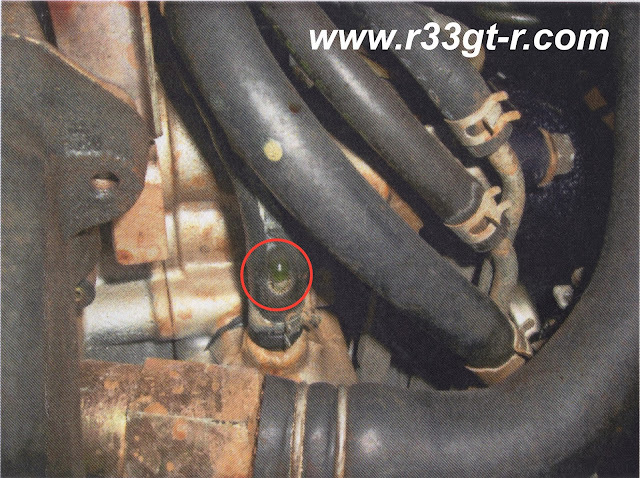 Long time readers will recall an incident from last year, when a water hose feeding the OEM oil cooler burst, leaking coolant everywhere, causing lots of white smoke to emanate from the engine bay, scaring me into pulling over at the side of the expressway, and calling for a flatbed truck to haul me to Mine's. 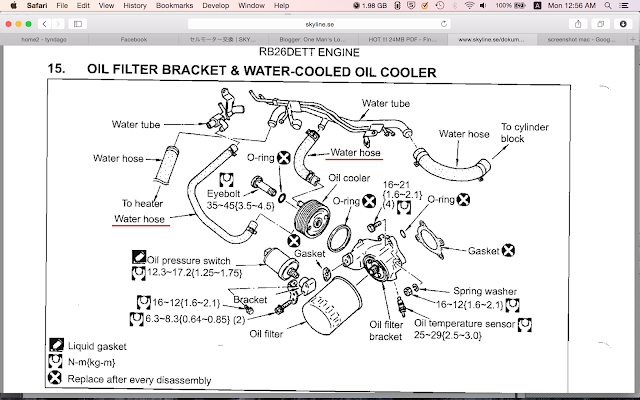 See below for the two water hoses feeding the oil cooler (underlined in red). As I explained in that post, even though I'm thrilled with the craftsmanship of the Mine's engine, and the performance nature of the custom VX-ROM, I've had several issues with some engine peripherals since the installation... a leaking water line, turbo oil lines breaking twice, and now this burst hose. Also in that post and also in the conclusion, I hinted at some "goodies" that ended up not getting installed. But it was all ok, Mine's got the car fixed and everything seemed to be fine. Surface rust only perhaps, but still ugly. The engine starter, covered with surface rust. And the rust was coming from above, right where Mine's had replaced that leaking hose. Hmm. Not happy - why? But it's THIS hose that's leaking now! Now, while my car never had any problems when I turned the ignition key and the engine would crank over, the mechanics were worried that, eventually, if the coolant dripped more and the rust spread, then there could be a detrimental effect and the starter "might go bad." Sure, sure, whatever. 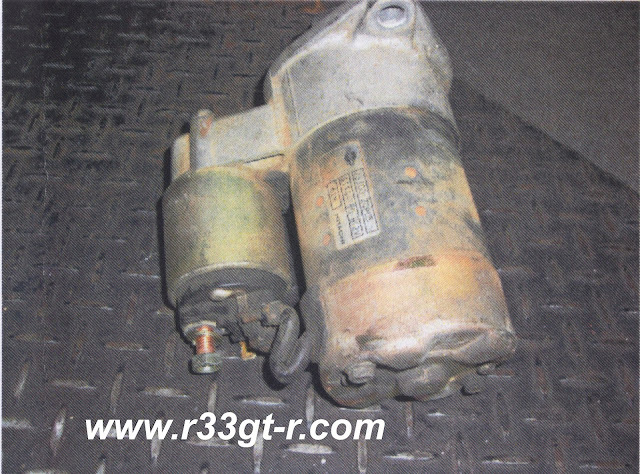 BUT, to me this was a legitimate reason to replace the starter with a new (or in this case, a rebuilt one). A new one was crazy expensive but a rebuilt was less than $200 if I recall correctly, so I had them install one while the transmission was lowered and that area was easily accessible. 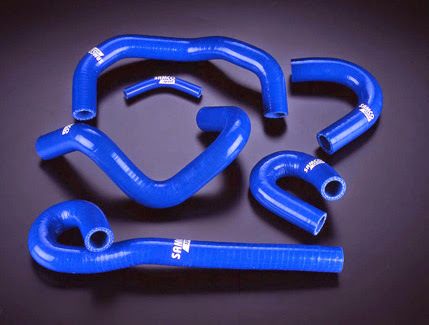 Full SAMCO heater hose kit. I had actually ordered, and obtained, this SAMCO heater hose kit in BLACK from my friend Wouter, in order to go for a stealthy look in the engine bay. However, with the car at Nissan, while I could have mailed in those black hoses, I simply asked Nissan to get and install what they had in stock, which were the normal blue set (reordering a black set would take a few weeks - from overseas - and I was too busy at work to send in mine) in order to get the main job of the transmission swap done ASAP. So I was under the impression that this heater hose kit, replaced the two hoses that had leaked. Apparently not (the mechanics had called me and told me this, but I figured might as well replaced everything that is old and likely to burst anyway). So, eventually I will have to find some silicon hoses to replace these going into the OEM heat exchange. In the meantime, I'm happy to report that the car now starts up like a motorcycle - i.e. very little resistance, it just fires up very quickly. So in addition to the 6 speed, the car now starts up like new and has some blue bling where most people will never see it. Not sure for you, try Amazon perhaps? 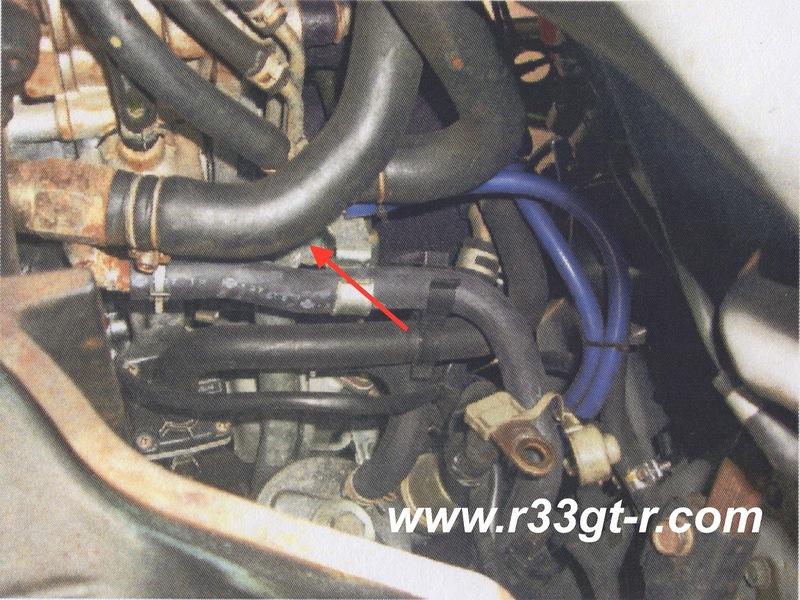 Did you ever end up replacing the hoses that weren't included in the heater hose kit? If so, where did you find these in silicone hoses? Nope, never did get around to it. I think some of these don't exist in silicone format, so I guess I'll have to just check the rubber ones occasionally! I recently contacted Dino, to get a hold of you. I'm working stateside on creating a few new products for the GTR since they are becoming legal for import in the states. After reading this article several times, and thinking about how hard it would be to purchase the OEM hoses, I reached out to Samco. 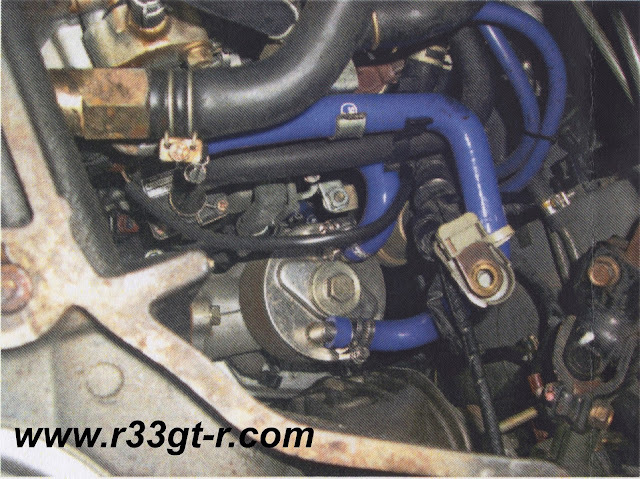 They replied in a well welcomed response, and are revamping their hose kit for the GTRs/RB26. 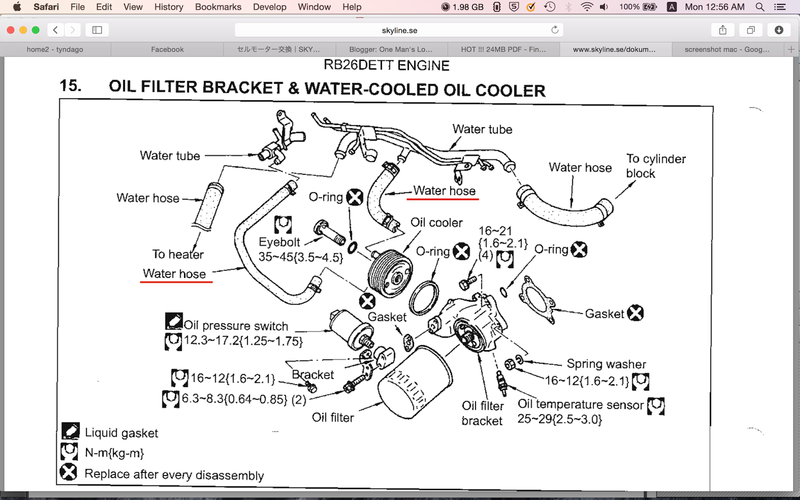 However, they are in need of the OEM Nissan part numbers for the hoses not currently included. I have done my best to search and find these numbers however its still a bit difficult. I wanted to ask if by chance this was something you could assist with. Aki, may i know the exact location for nissan prince? They are in section of Tokyo called "Sakura-Shinmachi." About a 10 minute walk from the local subway station, too! Appreciate this post is now very old (just going through your blog) but did you ever get around to replacing the rest of the hoses? I just finished this job on my 32 after I noticed the hose at the takeoff for the thermostat housing was leaking. I suspect that the hose to the cooler is something that commonly goes bad as I noticed mine had an approx 5 mm slit forming (got lucky that I replaced it before it went bad completely I suppose). Anyway, I replaced the hoses using this kit (Which is a full kit for all vacuum and coolant lines) in the OEM black colour option. If keeping things looking 'stock' is your thing then I'd really recommend it as it's pretty difficult to tell these apart from the OEM Rubber. But lots of other colour options are available too. I'm not exactly sure as to what if any differences in the hosing is present between 32/33's but the only issue I had was not being able to use the stock hose clips that attach to the bulkhead for the heater hoses (no big deal, I fashioned my own out of some Stainless P clips). Can get you some pictures if you wish. Controversial Interior Mod?? (gasp) Bling?